Very Important People of LEA have access to the VIP area. We grant alllies the VIP badge for free. VIP badge is worth 20c. Members of LEA higher than High Rank can get VIP badge for free. Banzai~Freeze~RollerSkate~IceTag~FireStarter~Stiki~Rights:5c/10 norms~Official Mods : -=:RaresFan:=- jokimon12345 VitaminB6 .PerpetuaL:. This badge gives access to the VIP room in the CIA. Make sure to look at the owner and confirm its made by Milap! Check motto, too lazy to change this everytime. come and play FF and FG prize is always 20c or higher!!! NO SCAM!!! JOIN NOW!!! We are dedicated to helping those working on their talent tree. Please find our Forum for more Info. This Is for the Olympique de Marseille Football Team Members to Practice Their skills. The original CIA Group has reached its limit. This is the third set of CIA members. #1 Habbo Group. The original version of this style church with the cross. 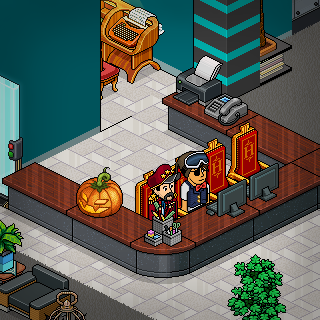 Room of the Week, February 2009, Habbo UK. Since 2008. Those who enjoy using 10gerrard8's skateboard boost room. Wired Maze Made By Tallia And Ben. These are the people that I trust the most. The place where the real fun begins! Games are usually daily. Games include original ideas and popular ones. A place for me to chill when im feeling down. I want to be alone..
Taken in this room on 29 October 2015 and received 1 likes.